PGM 2018 is the ninth edition of the meeting. The 2018 edition will be held in Prague (Czech Republic) from September 11 to September 14. The program chair is Milan Studený. 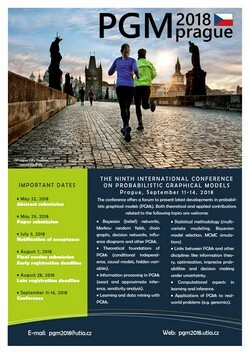 The conference is organized by the Institute of Information Theory and Automation of The Czech Academy of Sciences. Feel free to send us an email to pgm2018@utia.cas.cz for further information. Steffen Lauritzen is Professor of Statistics at the University of Copenhagen, Emeritus Professor of Statistics at the Department of Statistics of the University of Oxford, UK, Emeritus Fellow of Jesus College, Oxford, and Adjunct Professor of Statistics at Aalborg University. Steffen Lauritzen is the author of the monograph Graphical Models published in 1996 by Clarendon Press in Oxford. He is one of the founders of Hugin - a leading provider of advanced decision support software based on probabilistic graphical models. His main research interests evolve around graphical models and their applications. After the conference, a virtual special issue with a selection of extended versions of papers presented at the conference will be published in International Journal of Approximate Reasoning. Abstracts and papers must be submitted electronically through EasyChair.